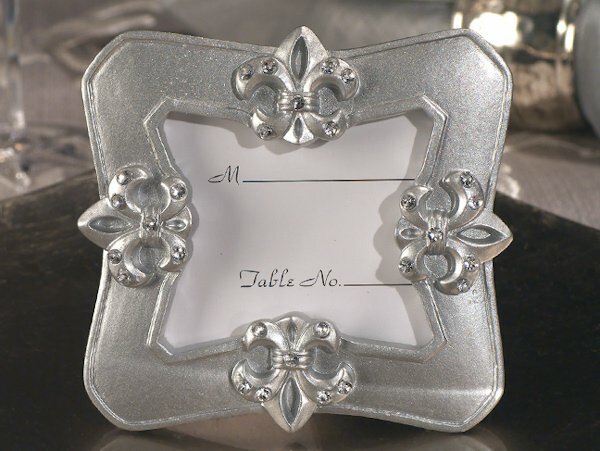 Your event tables will look tres chic when you seat your guests with these classy Fleur De Lis place card frames. After the event is over, they can use the frame to hold a 1 3/4" x 1 3/4" cherished photo. The silver resin frame features an elegantly carved Fleur de Lis symbol accented with perfectly placed crystals. Frame measures 3" x 3" and includes a place card insert. Comes packaged in a plain white box.